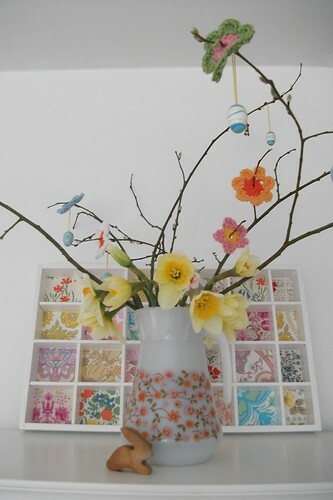 I have been making Easter flowers to decorate my branches, I'm having a bit of a flower craze here at the moment! I loved how they turned out and how they are cheering up my living room. I walked the dog up on the common, the breeze has dropped and it was really quite lovely to be back in our usual stride, taking in the views and marching along. We have been spending some time in much lower and warmer places! A supermarket dash, no.... not for a free trolley load! it would be quite handy at the moment though. Chicken and vegetable soup for tea!!....... I know, lots of soup, this one was a special request. Loads of soup to eat up now. Good job it's healthy. One load of eternal washing. Restrained myself from eating chocolate. Do spoonfuls of chocolate spread count!..... If there's any left I might make cupcakes topped with choc spread and little eggs.....I might.....but it's not a promise! I've cleared up the next few items from the attic. I have decided this holiday to tackle the attic. My aim is to clear most of it. So.....each day I am deciding about a few things at a time. Where do they need to go? keepers or leavers? I'm quite enjoying it. Oh and I spent the day here and there catching up with lots of reading. I am using bloglovin as a reader and getting used to that. I have transferred all my blogs over to here quite easily. So far so good. 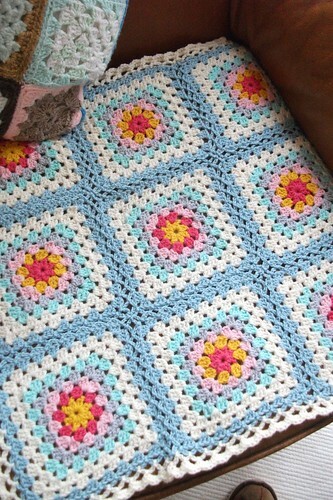 I thought I would show you my little easter rug. It's found a home on my chair. Infact it's just right for here. It started well, but turned out to be not the one! Not the one for spending weeks and months on. So it's happily finished and has a place, I just can't cope with any more unfinished things. CLEAR is my word this year remember. It did turn into a bit of an experiment with the zigzag edging and border.The colours were gentle, but rather reminisient of egg yolks!! definitely a spring rug. oh and last thing, this cushion is making me very happy. I keep walking through and looking at it sitting happily on my couch, where it's staying! Popping with colour and very happy. edited to add : if you have not already opened an account with Bloglovin, you can follow this link here. It's very easy to transfer all the blogs you are following in your google reader. They remain in your google reader as well, so for now you will have the choice of where to read them. 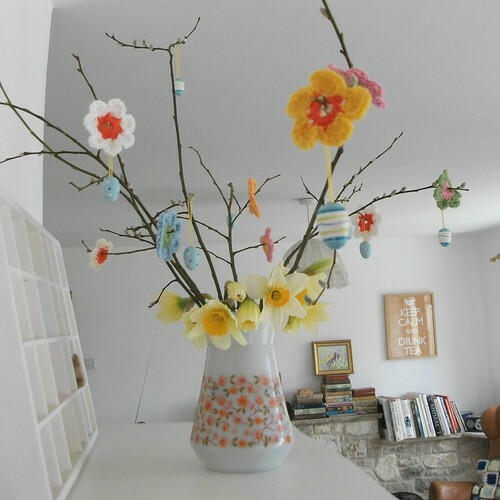 Love your Easter flowers, mixing fresh flowers with crochet flowers and eggs looks great! I hope the Easter Bunny remembers to bring me some chocolate.....I need it!!!!! Happy easter,Heather.Making flowers is quite addictive.They look lovley in garlands. yes you can open an account easily I have added in a link above now! 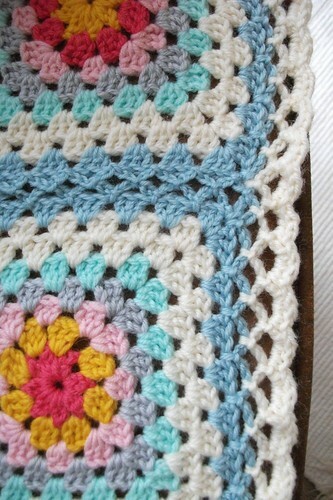 Both your little easter rug (lovely border!) and your cushion are very pretty! Enjoy the rest of the Easter! The flowers on the tree look very pretty in the vase - which in itself is gorgeous! The cushion cover...i know..you turn and look at what you have created and it brings a smile to your face :) Happy Easter to you !! Glad I am not the only choc spread pincher! Happy easter. 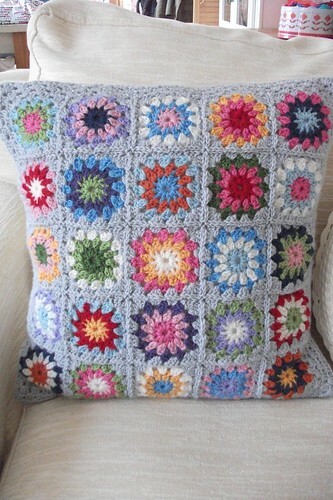 oh I love the blanket and the cushion, gorgeous colours! Hahahahaha--flash dancing around the room! We have videos too. My son and I love Kipper the Dog and can't seem to give those away--though he is way too old for them. Hi Heather, Hey! It's Easter!! No need to explain eating any sort of chocolate to anybody and also no need to feel guilty!! It's a Traditional Chocolate Eating Week-end!!!!!! !